Homemade granola is the best! Once you get the method, you can play with infinite flavor combinations. Being the height of citrus season and having a huge bowl of Meyer lemons sitting on the counter led to this fresh creation, Lemon Pecan Granola. The lemon and pecan are just the start of the flavor - with hints of coconut and sweet golden raisins making a complete granola family unit. I have a confession - I want us all to be healthy. 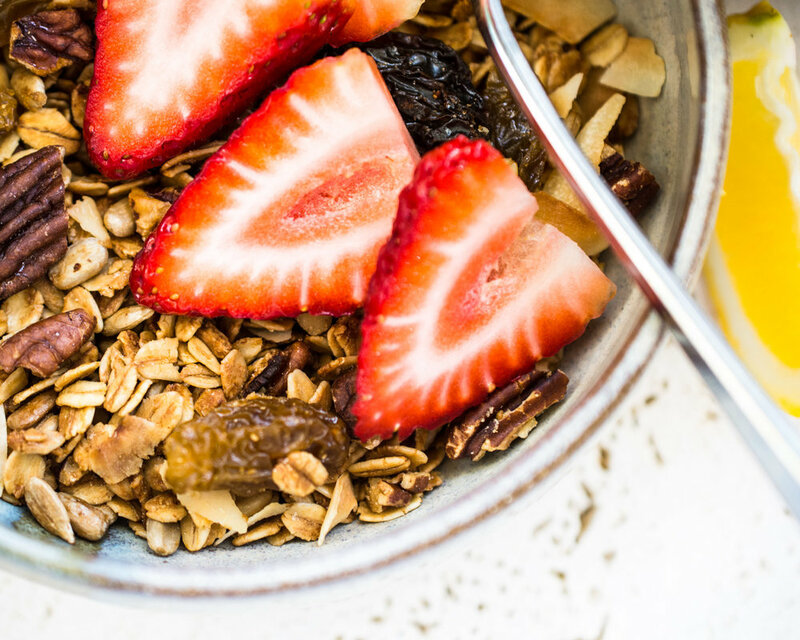 Granola can be a high fat and high sugar bomb but I have worked to keep this one in line. I have been making granola for years using this method. There is always a big jar on the counter that I pretty much never let get empty. Don’t leave me for this, but I have used a mild extra virgin olive oil for the fat. I promise you will like it! When I first subbed in olive oil, I did a blind husband test, even asking if he tasted anything “funny.” It passed and I disclosed - so all is good now. Adding golden raisins at the end of the bake allows the sugar to be cut back quite a bit. A note on the raisins, I was able to find a bag of mixed extra large raisins and they are a lovely addition if you can find them. Otherwise, use regular golden raisins or a combination of both. Fresh lemon juice and zest are key. You know the drill - zest the lemons first and then juice the lemons. If you juice first, it is almost impossible to retrieve the zest. You will use the lemon juice in the beginning as part of the coating. Save the zest to be added once the warm granola is finished baking. Oats, nuts and sunflower seeds are stirred into all the liquids and then spread onto a jelly roll baking pan. After baking for 45 minutes, stirring well every 15 minutes, the coconut flakes are added. Bake for 15 more minutes and then remove and add the lemon zest and raisins while everything is still toasty warm. Give it all a good stir and then let cool to room temperature. You will probably want to have a good sample at the point. I pretty much eat my way through the whole baking process by having a bite here and there. Once cool, store in an airtight container at room temperature. Serve with your favorite milk, mine of late is macadamia nut milk, and fresh fruit slices. It just happens to be the start of strawberry season in California. Enjoy! In a large bowl combine the lemon juice, maple syrup, olive oil, brown sugar and salt. Mix together. On top of the liquid add the oats, pecans and sunflower seeds. Stir until the oat mixture is well coated. Turn onto a 12 X 17 inch baking pan and place in center rack of oven. Stir at 15 minutes and 30 minutes. At 45 minutes add the coconut chips and stir them in. Return to oven for 15 more minutes. Remove from oven and stir in the golden raisins and lemon zest. Cool on wire rack and then store in an airtight container. NOTES: I like mine with strawberries on top and macadamia nut milk. Great on yogurt or on top of fresh fruit. I have been known to grab handfuls for snacking…..